Muster rolls of U.S. Navy ships, stations, and other naval activities, 1939-1949. 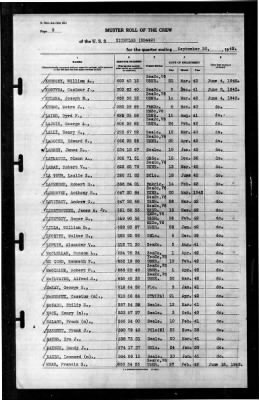 These records include detailed muster rolls listing all personnel assigned to ships, stations, and activities for the U.S. Navy, 1939-1949, as well as reports of changes for sailors transferred to other ships or locations, and those discharged, deserted, hospitalized, missing, or dead. Passenger lists for nonenlisted personnel are also included.